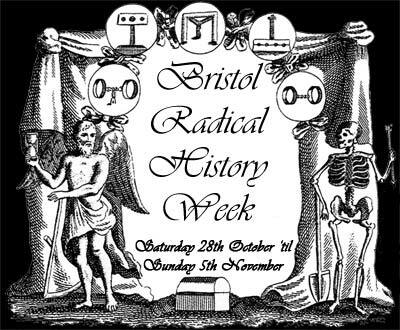 Bristol Radical History Week 2006 was a series of events aimed at opening up to public scrutiny some of the hidden and misrepresented history of Bristol. Rather then concentrating on royals, famous engineers or wealthy merchants, Bristol Radical History Week was concerned with the proper people of Bristol. The mass of sometime rebellious and mutinous people who had their own agendas to fulfil. The week also looked at the links to people who were drawn into the network of Atlantic trading that centred on Bristol as a port. These are the impressed sailors, West African slaves, transported vagrants, indentured labourers and pirates amongst others, who made up what has recently been called the 'Atlantic Proletariat'. Public commemorations with speeches, celebrations and re-enactments. A film festival featuring works relevant to the themes of the week. An exhibition of paintings, prints and artifacts. History walks charting the 'hidden' history of the city. Children's events featuring films, walks and painting. As well as the above events there was a week long art exhibition at the Spy Glass and a display of radical literature at Bristol Central Reference Library. Click here for details.